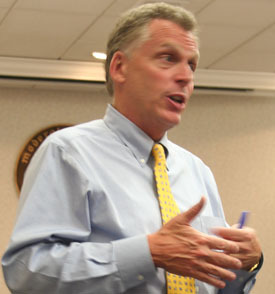 While touring Mikro Systems in Charlottesville on Monday, presumptive Democratic Party gubernatorial nominee Terry McAuliffe heard about the damage that the impending sequestration cuts would have on the business. Mikro Systems is a high-tech manufacturer with contracts from the Department of Defense and the Department of Energy that would be jeopardized by sequestration. Yesterday, The Hill newspaper reported that Attorney General Ken Cuccinelli refused to say whether sequestration should be avoided. George Mason University’s Center for Regional Analysis had projected that Virginia could lose more than 200,000 jobs if sequestration is allowed to happen.